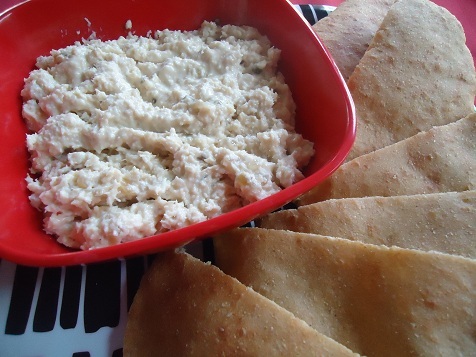 I couldn’t very well make homemade pita bread last week without making Chicken Salad, now could I? Matt happened to be out of town for two days last week on a soccer trip. The poor guy. All I talked about when he came home was how good the new pita bread recipe ended up and how I’d made chicken salad to go in it and served it all with fresh tomatoes from our garden. And how all four boys scarfed it up and came back for more. And then I had to tell him that all of it was gone – that we’d saved none at all for him. Not to worry. I’ll make him more soon. Have you tried the Whole Wheat Pita Bread recipe yet? Mix all ingredients together and serve on crackers, on bread, or in pita pockets. You can also use this recipe to make Turkey Salad with turkey leftovers after a holiday meal. This is one of my favorite ways to use up chicken or turkey leftovers! 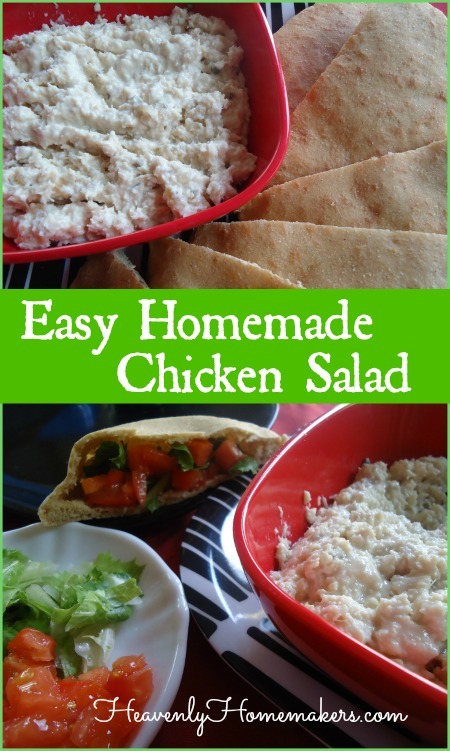 Chicken or turkey salad makes a wonderful convenience food! I have an egg allergy, so no eggs or mayonnaise here. But I missed tuna salad, so I made up a honey mustard dressing to mix with tuna fish. Not bad! Just a couple tbsp of each honey mustard and dijon mustard, a little salt and pepper, sometimes a little olive oil drizzled in if it’s dry. Can’t wait to try your pita bread recipe, thanks! Thank you for the nice idea to use a homemade honey mustard (I do not eat mayo). I will try that in my chicken salad next time! Mix mayo, lemon juice and curry together. Pour over other ingredients and stir gently. Serve in pitas or whole wheat bread. YUM! Ours is similar. No eggs. Apples instead of celery for the crunch. I’m okay with eggs in my chicken salad, but we like to have fruit and nuts in ours too. My favorite add-in’s are grapes, dried cranberries, celery, and almonds. Mmmmm! No eggs in chicken salad for us, bleh! I make 2 versions, one is chicken breast, toasted slivered almonds, garlic powder and mayo and the other is my late MIL’s version which is chicken,almost as much chopped celery, A LOT of fresh ground pepper and mayo. We do love egg salad but it has to be freshly made and not refrigerated. I know we are picky! We love chicken salad. Especially my husband who likes it when I add grapes and walnuts. Yum! Yum! Which came first the chicken salad or the egg? I prefer chicken in my chicken salad and eggs in my egg salad. I never thought of putting eggs in my chicken salad. I might have to try that as I really like egg salad. Thanks for the idea! Where do you find Hain’s Mayo? Is it GMO free? I have a hard time finding mayo without canola (sorry for the misspelling) oil in it… Anyone make it homemade? I either buy my Hain Mayo from Amazon or through Vitacost. Shucks, I assume it is GMO free, but I am not entirely sure. Yay I found it! And it DOES NOT have soy in it :D Yay!!!!!!! Now that you mention it, I like plain egg salad and plain meat salad. I would not put the eggs in your recipe. I definitely like eggs in my chicken salad. I don’t really have a recipe… I just wing it. :) Usually it includes chicken, hard boiled eggs, mayo (homemade), mustard, pickle juice, celery, onion, garlic powder, a dash or two of non-GMO soy sauce, tarragon from the garden, curry powder, dill, salt, and pepper. YUM!!! I’m going to try the pita bread soon! Do you have a good recipe for crescent rolls? I love boiled eggs (the white) in all salads and definitely chicken salad!! Homemade bread scares me!! But I think I may try your one hour rolls. Thx!! In my chicken salad, you will find loads of fresh parsley, maybe some fresh tarragon, finely, finely chopped celery, and usually sunflower seeds on top! We love grapes in our chicken salad. My recipe is just cooked chicken, mayo, lemon juice and green grapes. I cut the grapes over the salad with scissors (pointed down) so I can catch as much of the grape juice as possible. Why waste that good juice? How do you cook your chicken where it works best for the salad? I always throw grapes in mine! So good! !